What do you really know about xylitol? 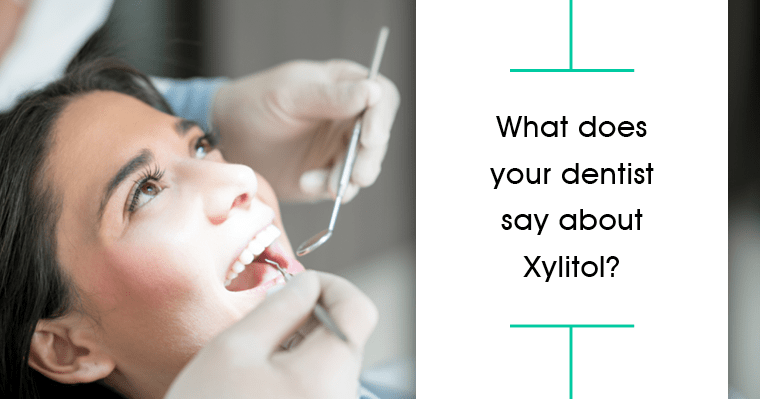 As a naturally occurring sugar, typically processed from birch trees and corn cobs, xylitol has gained popularity as a sugar substitute and potential dental hygiene game changer. If you’re grasping to understand how anything sweet can improve your oral health and shocked that your dentist is talking about it, you’re not alone. We’re here to give you the facts and answer the question: Does xylitol prevent cavities? How does xylitol prevent cavities? Most people don’t realize that dental caries (or cavities) are the result of an infectious and transmittable disease caused by one of the many oral bacteria living in your mouth called Streptococcus mutans. When this particular bacteria feeds on the sugar you eat, it produces acid that contributes to tooth enamel erosion, plaque production, gum disease, cavities, and eventual tooth loss. How does xylitol prevent cavities? Xylitol has properties that make it indigestible to bacteria, which decreases the number of bacteria with negative effects and reduces the instances of cavities. Xylitol raises the pH of the mouth, creating an alkaline oral environment which limits the growth of bacteria. Xylitol creates higher calcium levels in saliva which contributes to the production of enamel. Gum: Be sure to check the amount of xylitol in each piece (not serving) and if there are other sugar additives, like sorbitol or aspartame. Mints and Candies: See a great list of products here. Granular: Can be used for baking to replace refined sugar. Syrups: This may be a better option for children under four years of age to reduce the risk of choking. 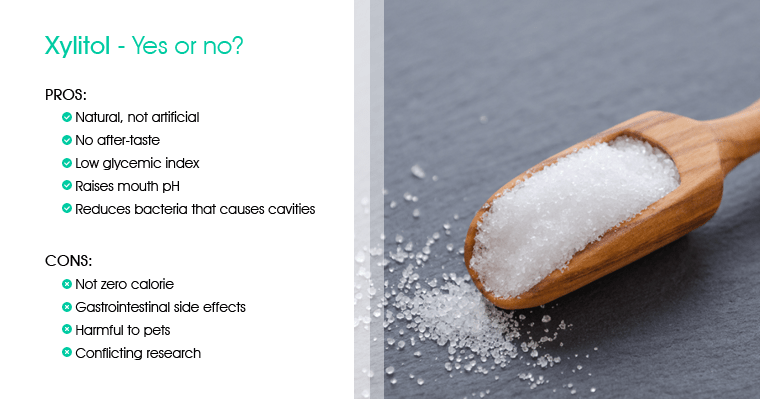 These are the scientific reasons why xylitol fights against cavities; however, clinical studies showing that xylitol reduces cavities are difficult to perform, leaving conflicting research on the validity of the claims. What are the facts you should know about? Although xylitol is found in fruits and vegetables (not chemically produced like artificial sweeteners), it is still highly processed. The best source of xylitol is derived from hardwood birch trees, rather than genetically modified corn products. Xylitol is not sugar-free, although it contains 40% fewer calories than sugar. People with diabetes should be aware that although it has a low glycemic index of seven (compared to 84 for refined sugar), it may still affect blood glucose levels unlike other natural sweeteners like stevia. Like most sugars, xylitol will pull water into the intestinal tract, which can cause gas, bloating, and diarrhea. People with IBS should avoid consuming xylitol. To minimize side effects, it is recommended that xylitol is introduced slowly, over a week or more, for the body to adjust. You will want to keep your xylitol away from your dog and avoid sharing food that contains the sweetener. Xylitol will cause their body to produce insulin, leading to hypoglycemia or even liver failure. So to answer the question: “Does xylitol prevent cavities?” – the answer can be yes and no. Your conclusions may be based on your values. Are you looking for a natural, healthier alternative to refined sugar? Are you one who needs evidence-based results from clinical trials? Are you looking for ways to reduce your risk of cavities any way possible? Xylitol has its place among a multi-faceted approach to dental hygiene. It would be extreme to say that chewing any sugar-free gum will ever replace daily brushing and routine visits to your dentist. And it would be just as unbalanced to claim that xylitol has no benefits to oral care at all. So we leave the choice up to you. Caring for your family’s oral health involves educating yourself on trending topics, prioritizing regular visits to your dentist, promoting a healthy diet and maintaining a routine of brushing and flossing. What we can say with certainty is that your dentist and hygiene team are always here to put your smile first!